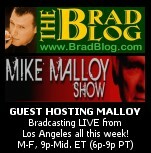 " Brad Guest Hosts the 'Malloy Show' Tuesday!	" Brad Guest Hosts the 'Malloy Show' Tuesday! We're back again tonight filling in as Guest Host on the nationally syndicated Mike Malloy Show. We'll be BradCasting LIVE all this week from L.A.'s KTLK am1150 9pm-Midnight ET (6p-9p PT). Please join us by tuning in, chatting in, Tweeting in and calling in! JUDGE VIC RAWL, Four-term South Carolina state legislator and circuit court judge, and recent Democratic candidate for the U.S. Senate nomination until the state's 100% unverifiable ES&S e-voting system declared unknown, jobless candidate Alvin Greene the "winner" of the questionable election on June 8th. We'll discuss that, his extraordinary protest hearing before the state Democratic Party, and where he'll go from here after finding what he calls "systemic software problems" and a "lack of election integrity" in South Carolina. ERNEST CANNING, member of the California state bar since 1977, political scientist and, most importantly, a guest contributor to BradBlog.com, on the case for impeachment against deep water drilling moratorium Judge Martin Feldman. HOUR 1: Desi Doyen joins us for some BP bashing at the top of the show, followed by Ernie Canning with the details on the many conflicts of interest of the impeachable Judge Martin Feldman. HOUR 2: The very honorable, and "bulletproof" Judge Vic Rawl on his insane SC election against the unknown Alvin Greene, and the lack of evidence to back up any of it. HOUR 3: A bit of ranting on Fox "News" and real news media fail, and a full hour of your calls! « PREVIOUS STORY "'Exit Strategy for Afghanistan: Alternative Fuels'"
"Brad Guest Hosts the 'Malloy Show' Tuesday!" Brad.... its the one year anniversary of your idiocy re rumors about Sarah Palin and why she left the Governorship. Are you just as stupid and gullible a year later? Just as big a liberal shill as before? IF YOU"RE LOOKING FOR THE LIVE CHAT ROOM, SCROLL UP! IT'S RIGHT UP THERE ABOVE COMMENTS! Something has GOT to be done about George W. Bush’s Supreme Court appointments Roberts and Alito. Can you say legislating from the bench? These two men with their fellow Conservative Justices are trying to hand over the USA to foreign corporate interests. Then we must push Obama/Biden to get rid of the Bush/Cheney Justice Dept/Judiciary before anymore Don Siegelman type malicious/vindictive prosecutions occur. The American PEOPLE must ORGANIZE… NOW, to get rid of the Corporate Conservative propagandists before they work the rightwing nutcases into a murderous, Civil War type frenzy. Limbaugh, Beck, Krystol, Hannity, Palin, etc must be stopped because there’s too many stupid, uneducated weak-minded Americans who fall for their crazy think tank BS! Conservative clones/spokespersons/pundits to use hate speech, race baiting, bold-faced lies, fear mongering, warped interpretations of the Bible and other textbook forms of bias persuasion to create a cult of right-wing wackos. And don’t give me that line about Conservatives deserve the rights or freedoms to spread their vile propaganda. THEY’RE DESTROYING THE NATION! The rich guys who own the news media might as well give national broadcast air time to Al Qaeda… I mean for all the BAD Republicans have done for the last 3 decades+. Waste, fraud, abuse, scandal, sexual deviancy, corruption, lies, incompetence, job outsourcing, off-shore tax evasion, reckless economics, welfare for the rich, deregulation, war profiteering, Constitutional violations AND a Corporate Crime Wave of epic proportions…. The WORST looting of a nation’s wealth and resources in the history of MANKIND! Where was the Tea Party Movement THEN? #*~/ ignorant hypocrites. But you want Democrats/Progressives to believe if only Conservatism had one more chance it can work? The very definition of insanity, isn’t IT? Over and over AGAIN! Just separate yourselves from Bush/Cheney… bull$#!~ MISINFORMED people into believing they’re part of a NEW Conservative Movement. In OTHER WORDS Republican Party talking points are based on the ignorance of their constituents. They revise history and LIE because they CAN… because morons who vote for Republicans DON’T KNOW THEIR OWN HISTORY! This ain’t NO Tea Party… this is a CLASS WAR! Do I miss George W. Bush? #*~/ NO! WE’VE GOT TO STOP THE MADNESS! The Loyalists did all they could to impede the PROGRESS of our Founding Fathers to form this great nation. They obstructed and spoke out against any talk of CHANGE or an American Revolution. Just like FOX news and AM Radio Free Conservative is doing to a Progressive movement. Thank GOD the American Patriots had the wisdom and courage to recognize what a THREAT these Loyalists were to the USA. They ORGANIZED, tracked down these traitor, DESTROYED their printing presses and PUNISHED THEM for their treasonous activities. Ohhhh, I see the Queen is coming to America to save her BP pension.